Are you a photographer or a tourist? I see many well composed images taken at the wrong times—harsh shadows, cloudless skies, and poorly aligned light are all signs that the photographer was sightseeing with his or her camera. Not that there’s anything wrong with that—if your priority was simply to record the scene, the image was a success. But to get the pictures serious photographers covet, you need to be out there at the most inconvenient times. These are sacrifices a photographer is willing to make, but others? Not so much. Many family vacations and intimate getaways have been ruined by the photographer who thinks it’ll no problem sneaking out for sunrise (“I’ll be quiet—you won’t even know I left”), or waiting just a few minutes longer after sunset (“Denny’s will still be open when we get back”). When I’m a photographer, my decisions put me outside when the conditions are most conducive to finding the images I want, with no consideration of comfort or convenience: Sunrise, sunset, overcast skies, wild weather, and after dark are all great times for photography, but not necessarily the most comfortable times to be in the elements. Face it—few people without a camera are thrilled to be outdoors when they’re sleepy, hungry, cold, or wet. That’s why, when I’m a tourist, my goal is to relax and and enjoy the sights with the people I love—I leave my camera home and simply take in nature’s splendor. My lights-out and rise times are based on comfort and enjoyment, and my forays into nature are timed for convenience and to coincide with the most pleasant weather for being outside. This approach keeps my body and mind fresh, my loved ones happy, and gives me a perspective that I think ultimately benefits my photography (try it sometime). Of course doing nature photography for a living makes it easier for me to . But what about the photographers who are so busy that their only opportunity to take pictures is when they’re on vacation? My suggestion is to get buy-ins on your objectives before the trip, and be as specific as possible: “I’d like to shoot sunrise on our second morning at the Grand Canyon,” “I’d really like to do a moonrise shoot in Yosemite on Wednesday evening,” and so on. The rest of the trip? Bring a point-and-shoot, store your serious camera gear out of sight, and don’t let anyone so much as see a longing glimpse in its direction for the rest of the trip. For today’s image I pretty much hung out (alone) in miserable snow and wind waiting for the storm to break. On this stormy evening, I chose the bridge just east of El Capitan Meadow. Though there were no guarantees, I knew if I went inside to warm up, I’d be out of position if something special happened. 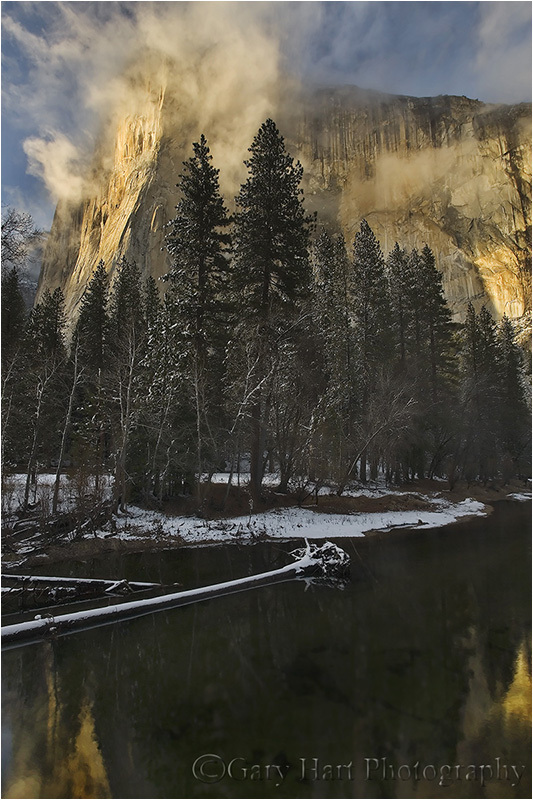 Shortly before sunset the snow stopped and soon thereafter I was treated to about 20 minutes of beautiful warm light dancing with the retreating clouds swirling atop El Capitan. Of course there are many times when nothing happens and all I get is soggy clothes and frigid limbs for my trouble, but those times only make the successes like this that much more special. I agree with you but I confess to being both at the same time. Thanks for reading, Ralph. Yeah, I realize that it’s not as easy for most people to separate the two as it is for me. My dad was a serious amateur but was so busy most of the time that he only got to take pictures on family vacations. I won’t say that the rest of the family was always thrilled about it, but I suffered no permanent scars. Excellent post, Gary! Tourist or Photographer? Your photos in this post are simply stunning and I can appreciate your efforts to capture these landscapes, albeit under difficult weather conditions. Absolutely STUNNING photographs Gary. The price of beauty. Many of my friends and family do not like it when I take time to make photographs. I don’t have a car and try to catch what I can when I travel with friends and family. I ask if they mind me taking some quick shots and I try not to piss them off. It is a juggeling act. Yeah, it is definitely a juggling act. The more you can negotiate the photo time in advance, the better it is for everyone, but of course Mother Nature is a fickle subject. Hola, para un turista tomar una foto parecida a estas es como tocarle la lotería…..
Gary, that’s a great article. Had that conflict when traveling in Eastern Europe in May with my daughter. Had high expectations for photography which I discovered I needed to put aside for the experience of traveling with my daughter, who had just finished her junior year in London. So I took a bunch of quick, mediocre snapshots!